Hey y’all! As some of you may know, I just signed up with Young Living. This was not something I did for the “business” aspect (although you can make a very profitable and lucrative business out of being a Young Living member*) but rather to take advantage of their household cleaning products and premium oil selection. So I wanted to pop on here really quick and talk to you about the Young Living Premium Starter Kit. I do not consider myself a super healthy person or live a completely chemical or toxin free lifestyle. I never really gave too much thought to the household product ingredients that we use. I haven’t really cared about changing up our products for healthier ones and even though I have children, this has not been something I have wanted to change. If it worked for our parents, gets the house clean and is convenient to pick up, it’s good enough for me! Different cleaners tested against YL essential oils & products. This is bacteria from the bottom of shoes! Yuck!! The other reason reason I got started with Young Living was because of the oils. I am not a holistic wellness guru, so don’t get me wrong, that is not why I wanted to get started with oils. I wanted to incorporate oils into our home because of the many benefits they have and for just ONE oil! A lot of them overlap, but they also have their own unique properties. You can use them by themselves, some of them can be ingested, you can wear them topically and a lot of them aid in sickness and have major skincare benefits. If you’re in the market for essential oils specifically, want to start introducing chemical free and toxin free products into your home and build a healthier lifestyle for you and your family, Young Living is a great place to start. They’ve been around for 20 years and are the leading company for innovative oils, blends and health and wellness products. There is TONS of information about the company, their products, diy blends and a million other things. I started with the Premium Starter Kit. It comes with 10 essential oils (five are immediately digestible) and a bonus blend of Stress Away. They also include a rollerball that easily attaches to Stress Away for you to start enjoying your kit immediately and get rid of some of that unwanted stress (mama's where you at?). You also get to choose a diffuser (which doubles as a humidifier). So it’s great for sick children and purifying the air in your home (or kids rooms). Difusing oils is another way to instantly start enjoying the benefits of your essential oils (use Thieves & Raven to cleanse the air). They also include a sample of Thieves Household Cleaner to start getting your house really clean (see above!). There are also two Ningxia Red shots which are a blend/purée of essential oils, fruits and vegetables. Drinking these first thing in the morning is another way to enjoy your kit! Here is a 9 Day Starter Kit Challenge. More way for you start using your kit right away!! Keep in mind, these are for adults and the Young Living starter kit oils specifically. Can you believe all that stuff comes in one kit? Sign me up! Or if you’re not interested, but know someone who would, get them a kit as a gift! Below is a graphic with the benefits of each of the oils included in this Premium Starter Kit. 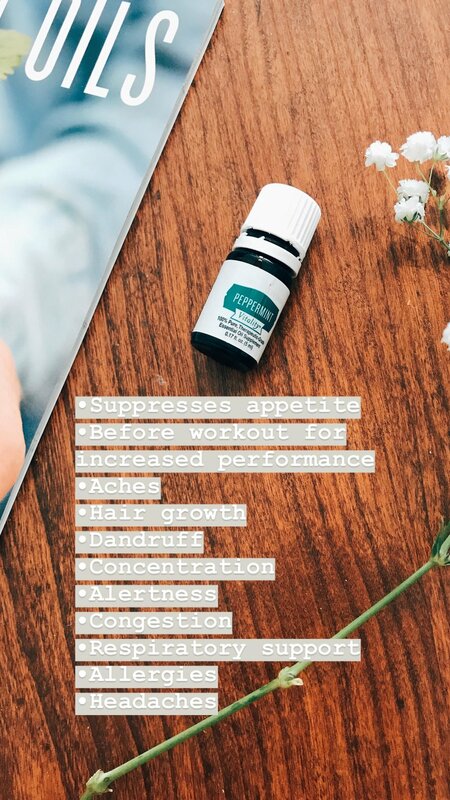 As you can see, there are so many benefits for each oil. Like I said before, some of them overlap but each individual oil holds its own unique properties too. If you have a baby/infant going through teething (like I do), the Copaiba oil sounds amazing! And look at everything else it can do - almost seems too good to be true. It’s also a part of the vitality* line, which means it is able to digest as is (no diluting). Although I wouldn’t recommend that for a baby, only for adult use (18+). My upline said she used it on a canker sore and it cleared up in minutes! some more ways to use the oils in your kit!! I will be keeping everyone updated on my Premium Starter Kit uses and featuring a daily oil on my Instagram Stories. There is a “Young Living” highlight tab on my Instagram. Follow along with me there on my journey to learn more about Young Living, each essential oil and other products from the Premium Starter Kit. Keep in mind, you do not have to get a premium starter kit to get started with essential oils. There is a Basic Starter Kit you could start out with until you feel confident and comfortable using essential oils. And you’d still be considered a member with member perks! I understand, the Premium Starter Kit is a bit of an investment, but one I think would be well worth it. But, maybe essential oils just are not your thing. That’s OK! Young Living also has a baby line called Seedlings, Kid’s products, an animal line called Animal Scents, a Healthy & Fit line (with so many different supplements), a cooking line and personal care lines with skin care and beauty products. There are five different starter kits to choose from too (see, not just oils!). For this option, you would select “other premium kits” when you get to “Step 1: Chose Your Starter Kit page. Young Living is your one stop shop for everything you need for a healthy lifestyle. Enjoy member rewards for your benefit and family alone, or make a business out of it. Do you want to join me in creating a healthier lifestyle for you and your family? If so, sign up today for your Premium Starter Kit and get access to all these benefits plus our community and network of young living members. I just started, but some of these girls have been around for over five years! That’s a wealth of healthy knowledge you don’t want to pass up. And PLEASE, Please, please let me know if you do sign up (or have questions!! ), so we can chat about what your wants and goals are from Young Living. *Send me an email or reach out to me on Facebook or Instagram if you want to be a part of my team. I am currently looking for three serious people to build a team with!! **The vitality line is regulated by the FDA, since it is being injested. All other essential oils/blends are not. Their qualities represent the properties in that oil, based on research. Each person’s experience is their own.